controlled environment to ISO 9001:2008. 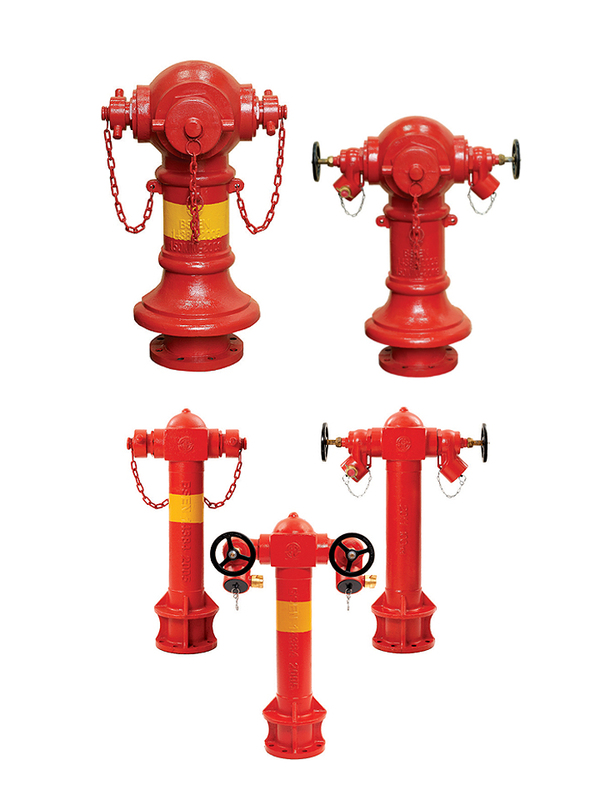 There are several models and configurations for the 2-Way and 3-Way pillar hydrant design. Model Fig.250 – 100mm x 2-Way with 65mm Male LVT Outlets. Model Fig.260 – 100mm x 2-Way with 65mm Oblique Landing Valves. Model Fig.270 – 100mm x 2-Way with 2 nos 65mm Oblique Landing Valves. Model Fig.280 – 150mm x 3-Way with 2 nos 65mm Male LVT Outlets and 1 no 125mm Male LVT Pumper outlet. Model Fig.290 – 150mm x 3-Way with 2 nos 65mm Oblique Landing Valves and 1 no 125mm Male LVT Pumper outlet. The outlets of the above models can be customised to suit other national standards and customer’s requirement. eg., ANSI #150 FF etc., available upon request. External – Primer and RAL3000 “Red” finished coatings.